I'm wondering why the concept of seven days figures so importantly in religion. To me, the other traditional timeframes make more sense. Years, months, days, even hours, are based on natural changes, whether it's the seasons or the moon's phases or the sun's daily cycle. I know that the idea of the Sabbath has to do with the story of creation, but how does a seven-day cycle manifest itself in nature? Or does it? You are quite right: Seven-day cycles don't have much to do with the natural time markers around us - the sun, moon, and stars. But in biology, seven-day natural cycles are common. There are actually several hundred scientific books and articles that refer specifically to seven-day cycles in nature. Although a whole host of life forms have well-defined weekly cycles, most of the research has been medical. Scientists have documented bona fide weekly fluctuations in human blood pressure, heart rate, blood chemistry, body temperature, kidney function, tooth development, urine chemistry and volume, stress hormones, various neurotransmitters, and the immune system. Weekly rhythms appear easiest to detect when the body is under stress, such as when it is defending itself against a virus, bacterium, or other harmful intruder. For example, cold symptoms (which are really signs of the body defending itself against the cold virus) last about a week. Chickenpox symptoms (a high fever and small red spots) usually appear almost exactly two weeks after exposure to the illness. Doctors have long observed that response to malaria infection and pneumonia crisis peaked at seven days. Organ transplants face similar crises as the body's immune system attack the foreign organ. When a human patient receives a kidney transplant, there is a rhythm of about seven days, a predictable rise and fall in the probability that the body's immune system will reject the new kidney. A major peak of rejection occurs seven days after the operation, and when a serum is given to suppress the immune reaction, a series of peaks occurs, with increasing risk of rejection, at one week, two weeks, three weeks and at four weeks. One might wonder whether all these biorhythms are simply marching to the rhythm of a cultural cause - i.e., the fact that people keep time according to weekly schedules, but this is apparently not to the case. One proof comes from the research of renowned chronobiologist Franz Halberg, who studied humans isolated without time markers in a cave for over 100 days and found that their seven-day cycles remained intact, regardless. This is especially intriguing since the average circadian or daily rhythm for such people is known to be about 25 hours on average. Interestingly, it's not only humans that are wired for weeks. Mice, insects, algae and even bean seeds are all known to have seven-day cycles of bioactivity, even under constant environmental conditions. Of course we don't keep Shabbat because we are biologically attuned for it, but it's nice to know that the One who created the world in six days and then rested on the seventh, gave us the Shabbat not only as a commemoration of His work, but as a perfectly timed rest from ours. The other event that Shabbat commemorates is the Exodus from Egypt, a story of miraculous redemption, the integration of unlimited G‑dliness into a very limited world. 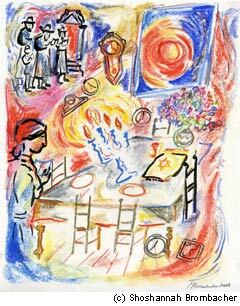 Keeping Shabbat gives us that little taste of infinity, time beyond time, every week. In the grander sense, the world is built on a sevenfold timeframe of millennia. The seventh millennium, the Shabbat of Creation, is the ultimate redemption by Moshiach, the light of which is already shining now. The problem is to prepare. Our "daily rhythm" is running late - we are naturally predisposed to drag our feet in exile, looking for that extra hour, feeling that there is still plenty of time to prepare. The Lubavitcher Rebbe sounded the alarm, waking us up to the fact that Moshiach is coming now, not later. And once that Big Shabbat comes in and all living beings synchronize their "seven-day" cycles with that, the whole world will see that there is nothing more natural than living with miracles all the time. After all, isn't that the rhythm we were made for in the beginning? Dr. Arnie Gotfryd, PhD, is a chassidic Jew and environmental scientist, having earned Canada’s first doctorate in Applied Ecology. He designed and taught an accredited, award-winning undergraduate course called Faith and Science which has been the most popular offering at University of Toronto’s New College for many years. He writes and speaks extensively on the interplay of science and faith, and what it all means for the individual and the world at large. You can visit his website for more. Are We Obsessed with Prohibitions? weekly need for rest Am actually interested in this topic, and was wondering if you could direct me to some of the scientific research that you referenced.